A Brand New Smile in Six Months or Less! Many people wish they could have straighter, more even teeth, but just can’t commit to several years of wearing bulky metal braces. Fortunately, at our Friendswood dental practice, Dr. Montz provides an innovative version of orthodontics to solve your crooked teeth woes. We offer Six Month Smiles—a teeth-straightening system designed to give you more even teeth in just six months! With Six Month Smiles, you can enjoy straighter teeth in a fraction of the time it takes braces to align your teeth. Six Month Smiles is also subtle, comfortable, and surprisingly affordable! It treats your front teeth with clear brackets and tooth-colored wires which are unnoticeable to most people. These braces then constantly exert a gentle force on your teeth to quickly shift them until they are in their most advantageous locations. Patients with straight and beautiful teeth can have more than positive self-esteem. They also enjoy increased oral health. Crooked, gapped teeth can expose your teeth to harmful bacteria which contributes to bad breath, tooth decay, and gum disease. With proper care, the average patient treatment time is just six months, cutting other orthodontic treatment times in half! Clear brackets and tooth-colored wires are mostly imperceivable to your peers. Fewer visits and adjustments are required. At each appointment, we will ensure that you are comfortable with the way your teeth are shifting. Six Month Smiles are affordable. They often cost less than other forms of orthodontics. Get Straight Teeth in Friendswood – Schedule a Braces Consultation Today! Not every patient is a candidate for these fast-acting orthodontics. However, many patients with healthy dental hygiene habits can usually wear Six Month Smiles braces. 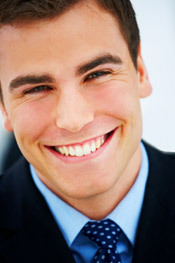 The best way to find out if you are eligible for Six Month Smiles is by consulting with your dental professional. Dr. Montz will help you determine if Six Month Smiles is the best tooth straightening treatment for you! Give us a call today to schedule your free consultation at our Friendswood practice. We serve patients from Friends, Pearland, and League City!